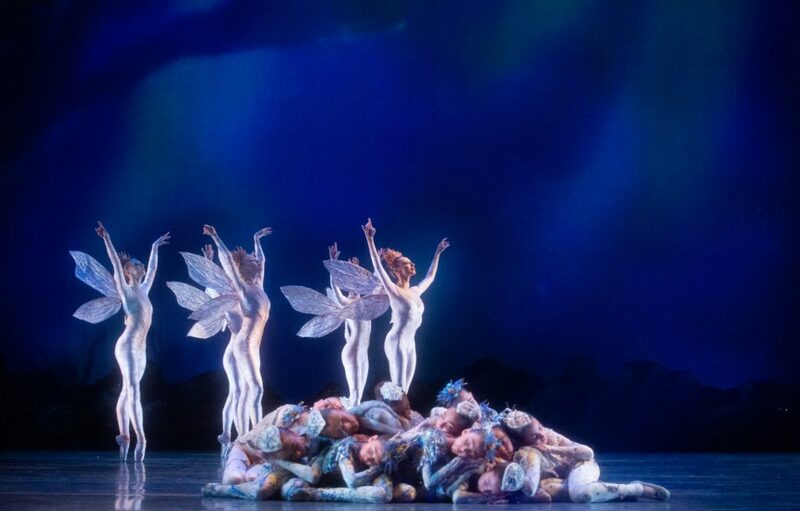 The visually lavish production of George Balanchine’s evening-length ballet A Midsummer Night’s Dream closed out Miami City Ballet’s 2018-19 season in the Palm Beaches last week. This revisit of the $2.1 million reimagining of the original work was something to behold. The spectacular set and costumes were by artist Michele Oka Doner, who looked to the Miami waterways for her otherworld theme. Using the University of Miami’s extraordinary archive of marine specimens, Doner’s set was a flow of constantly moving images of aquatic plant life projected onto a series of sheer scrims. The projection design by Wendall Harrington transformed the stage into a rich, voluptuous space that was further enhanced by the changing saturated colors onstage by MCB lighting designer John Hall. From the play, one knows that all that takes place on the stage is but a dream. What is needed is a nice dose of magic, but in the April 6 performance at the Kravis Center of this dazzling production, there seemed to be less magic than when it was premiered in 2016. If one is familiar with the storyline of Shakespeare’s romantic comedy, it was easy to let the simplicity of the drama on stage (which at times was overacted and at other times underacted) just blend into the inviting lushness of the visuals. In Act I, the music, set, projections and costumes were so extraordinary that even though the choreography had some sparse moments, the first half of the show went down very smoothly. 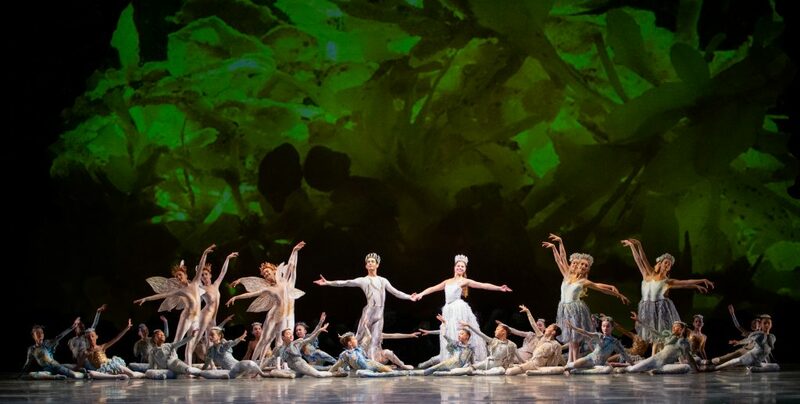 Samantha Hope Galler as Hermia was eye-catching in her solo as was the lead Butterfly Ashley Knox, with her entourage of gossamer-winged beauties Itzkan Barbosa, Mayumi Enokibara, Raechel Sparreo and Ao Wang. But who really stole the show was Renan Cerdeiro as Oberon, the king of the Fairies. He sparkled in every entrance, thrilling us with the exquisite execution of his brilliant technique. The height of his jumps, the clarity of his beats, and the ease of his movement stole my breath. Perhaps his character was not as conniving and mysterious as it should be since Oberon is the manipulator in this convoluted story of love who gets Puck (danced by Alexander Peters) to cast spells not only on two sets of lovers but also on his Fairy Queen (danced by Jordan-Elizabeth Long). After all, it’s Oberon who devises the spiteful spell that causes his pugnacious queen to become infatuated with the ridiculous Bottom (in this water version, a manatee, instead of a Shakespeare’s original donkey) danced by Emilien Rivoire. Balanchine was inspired to create his first full-length work in the United States by a few particular pieces of music by Felix Mendelssohn. His ballet A Midsummer Night’s Dream premiered in 1962 but it had been a longtime dream for Balanchine. He loved the overture Mendelssohn had composed for the famous play in 1826 as well as some incidental music he wrote in 1843, but put together they were only an hour long. Needing more music for a full-length ballet, Balanchine studied the composer’s works for two decades in order to find the appropriate compositions to create an extended score for his version of the famous tale. The Opus One Orchestra under the leadership of guest conductor Ormsby Wilkins gave an outstanding performance of the collected Mendelssohn compositions. Act II was a complete departure from Act I and almost felt like another ballet. Gone were the underwater themes, the undulating and almost holographic images of varied vegetation in the sea world of Miami’s waters as well as any further storyline. Instead the stately patterns and formations of a grand ballet were introduced as the dancers — now dressed in tutus and tunics — danced first to Mendelssohn’s “Wedding March.” Courtly and regal, it was classical ballet — Balanchine style. The center of Act II was the beautiful Divertissement, a pas de deux that was so pristine that it must represent perfect love. The lovely Katia Carranza was as engaging as always, giving a sensitive and pure performance of this truly beautiful duet which appeared deceptively easy but in reality had some very challenging partnering sequences. Renato Penteado, who will be retiring from the company after 19 years, navigated the intricate grips and changes of direction in the partnering masterfully thereby allowing Carranza to do what she does so very well — create delicately nuanced and connected transitions between her aesthetic lines. The closing images were splendid. Amid a throng of circling young children, the no longer feuding Oberon (Cerdeiro) and Titania (Long) slowly crossed the stage towards each other with their magnificent long capes spread luminously in the light and then, in the last image before the curtain fell, the children gathered onstage carrying small lights looking like fireflies on a midsummer’s night while Puck darted in and out until he was magically lifted up into the air like Peter Pan.